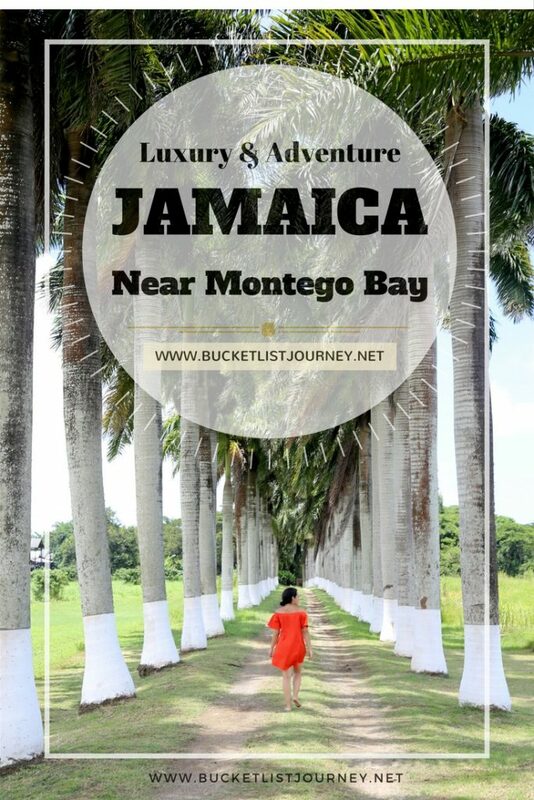 Ask any tourist heading to Jamaica what their first stop will be and there is a very good chance that they will say Montego Bay. 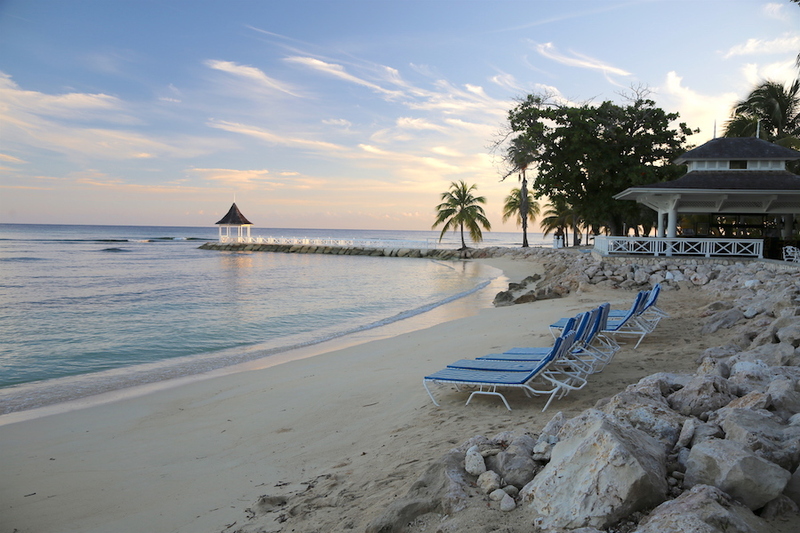 Everybody knows Montego Bay in Jamaica, mostly because of the abundance of luxury resorts that reside there. 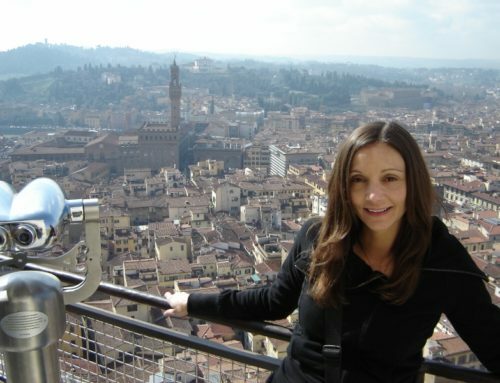 It’s actually where I spend my honeymoon 20 years ago! Mo’ Bay, as it is so fondly referred to by the locals, is the second largest city in this island nation that has become synonymous with the Caribbean. As far as coastal Jamaican cities go, it might just be up there with the best of them. Not only does it have scores of pristine white sandy beaches, but it also has a wide array of sites, shopping options and activities to keep you thrilled and entertained throughout your stay. 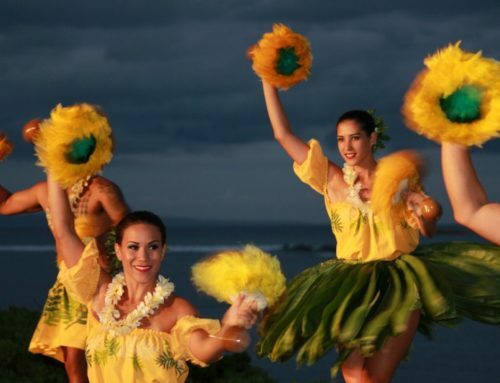 Many visitors will book one all-inclusive resort for their entire trip to the island and never leave. And there’s absolutely nothing wrong with that. But, if you want to indulge in an array of luxury and adventure nearby (within an hour or two drive), and only have a couple days to spare then here are some things that will have you immersing yourself in the island life. Whether you are arriving to Montego Bay by air through the Sangster International Airport or coming in through the enormous cruise port downtown, make a pit stop either at Juici or Tastee for a taste of Jamaican tradition. 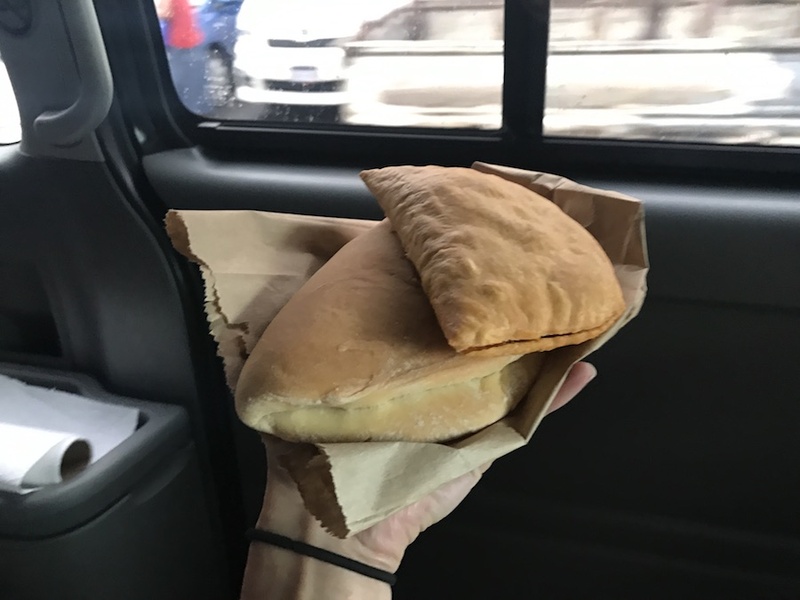 These are the two popular eateries serving one of the Caribbean islands most popular street food called beef patties, which is similar to an empanada. 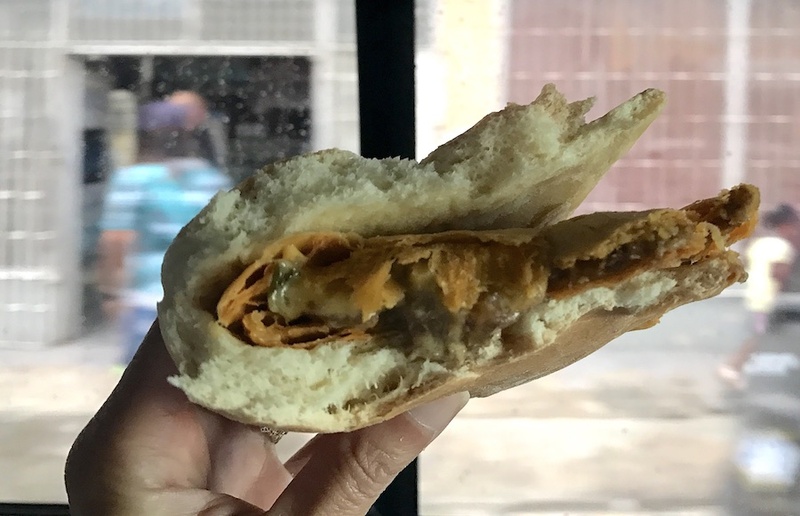 They have numerous fillings from chicken to beef and even salt fish that are stuffed into a flaky pastry pocket. On my visit to Tastee, I ordered a beef and cheese patty with coco bread, a dense bun made with coconut milk. The idea is to stuff the beef patty pastry, inside the coco bread. Double the carbs! The ground meat had a little bit of a kick to it, similar to taco seasoning. It is an adventure in the local cuisine. TIP: Offer your driver a few patties of his own and he’s sure to be happier about making that pit stop. 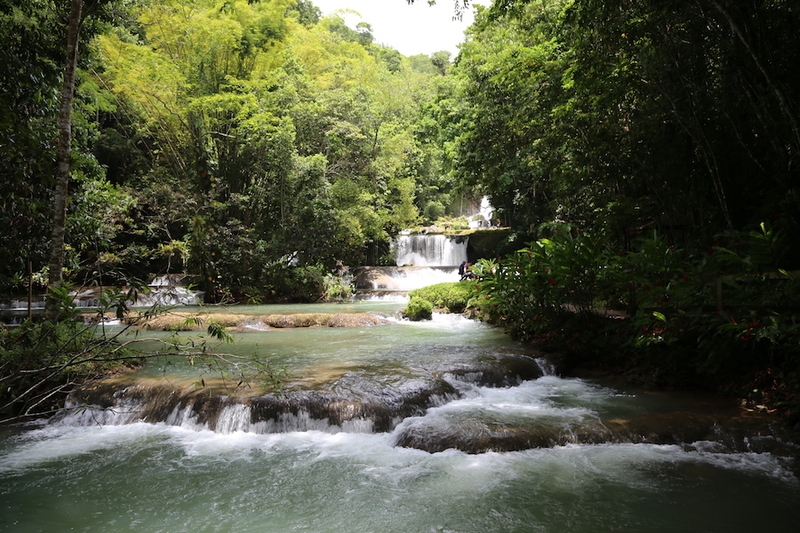 Most travelers to Jamaica know about Dunn’s River Falls, but YS Falls is a little lessor heard of. That can only mean that it offers you little more of a private, personalized experience that is quite frankly – unforgettable. 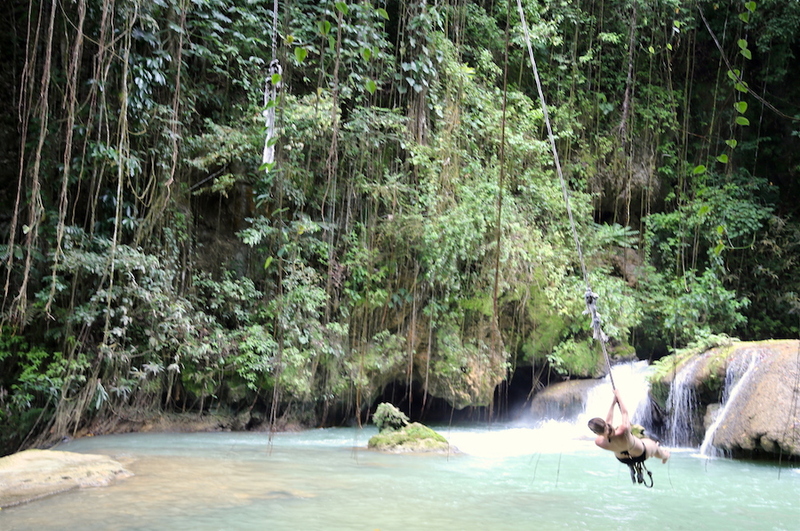 This 7-tiered waterfall offers a thrilling zip-line, a spring-fed pool, picnic grounds and, most importantly, a fun ride on the rope swing that will have you plunging into the refreshing water below. Even though YS Falls is lessor known, it can still get a little crowded later in the afternoon, so I recommend arriving early. 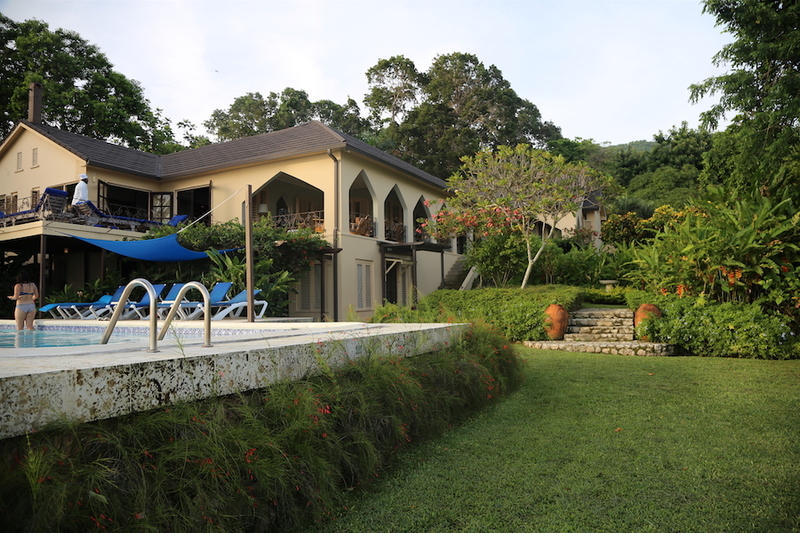 Resorts such as the Bluefields Bay Villas are a huge part of why people love Jamaica so much. At Bluefields they offer six 5-star private villas in one of the most serene and quite honestly, surreal environments in the region. You can sit on the patio with a rum punch and listen to the sounds of nature for hours. I did it just that! But, what really sets them apart from the rest is that you have the opportunity to have a full staff including a chef (who is amazing! ), housekeeper and a butler, plus a nanny. We had it all and were treated like royalty during our entire stay! Our team kept us pampered, well-fed and ensured that we wanted for nothing. Our villa, Mullion Cove, had a beach front where we could kayak, paddle board or simply sunbath. Just another reason that when you visit Bluefields, you will most likely never want to leave. 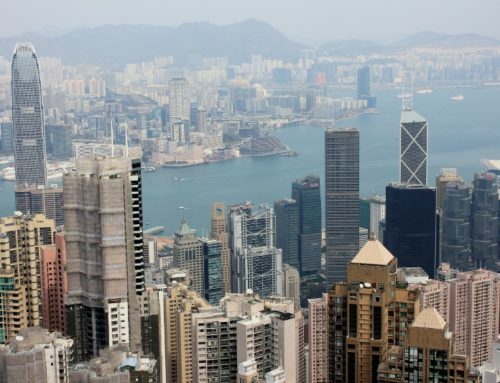 As if all that wasn’t luxurious enough, they even offer a helicopter transfer from the airport! 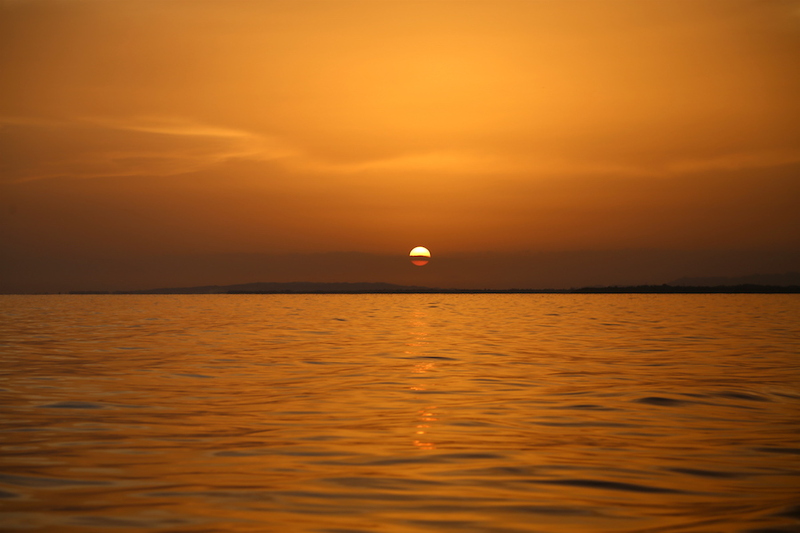 While staying at Bluefields, have them organize a sunset boat ride that you will never forget. The boat will take you along the water’s edge to see the line of pristine resorts (including your own), then park in the middle of the sea while the sky turns a beautiful burnt orange. Check out of your luxury villa (I know you don’t want to! 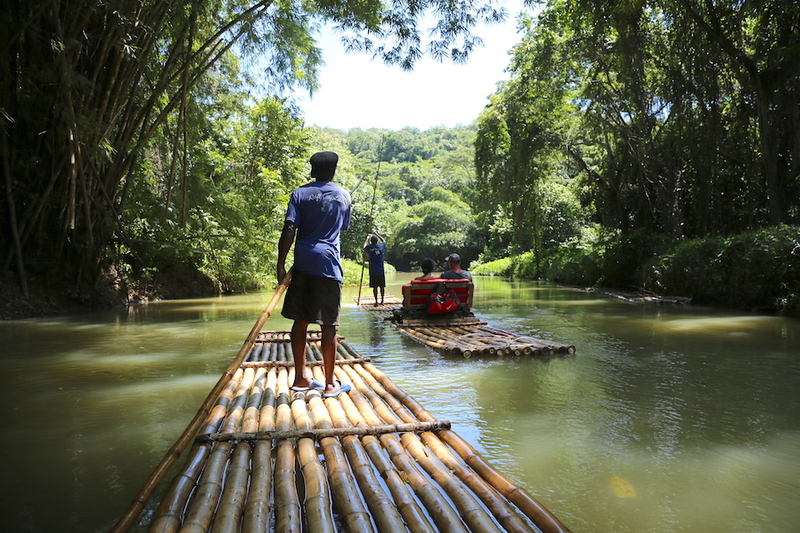 ), and head over to Martha Brae River where Bamboo rafts at Jamaica Rafting will be ready to take you on the 3 mile ride. 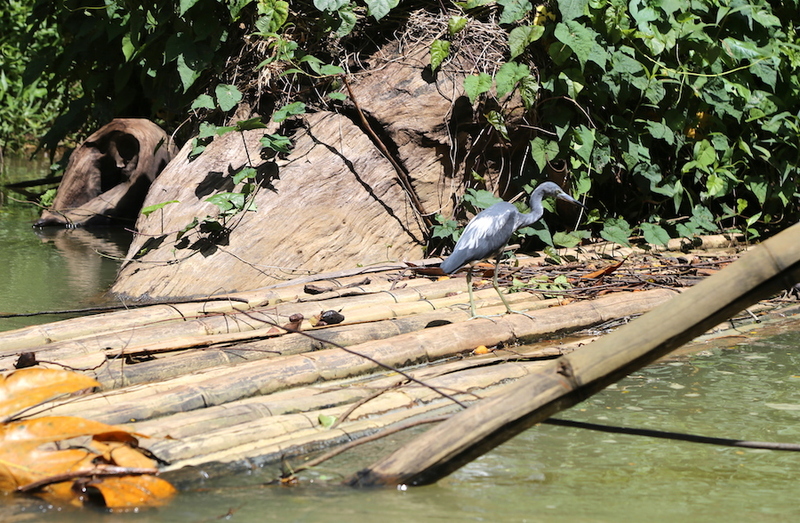 The ride on the 30-foot long ‘2 person’ raft is not only very relaxing, but also informative in Jamaican wildlife and nature. We saw blue herons, bamboo, mango, banana and fig trees, plus a termite nest and a cool ‘sensitive plant’ that closes when you touch it. There are also stands along the way selling coconuts, paintings and other souvenirs. TIP: Ask for a guide who is able to identify all the plants and wildlife along the way. This makes the experience a lot more interesting and informative! 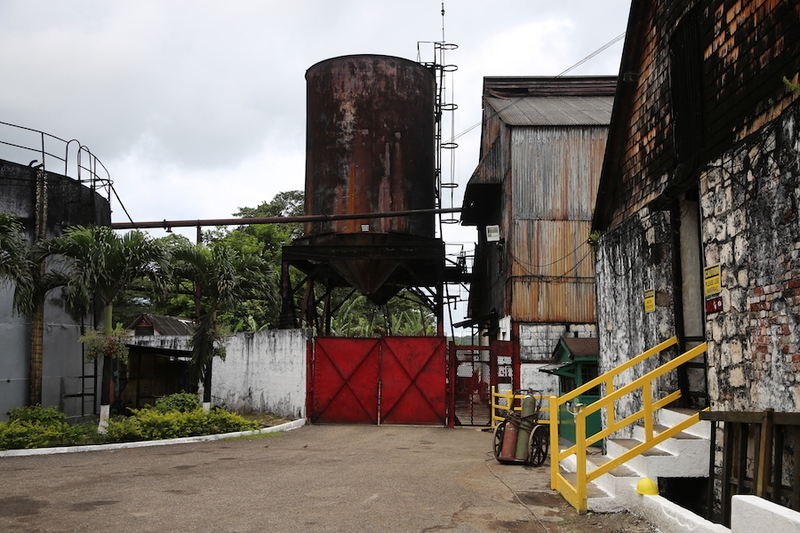 Jamaica is well known for its rum drinking culture and what better way to explore it than with a distillery tour? 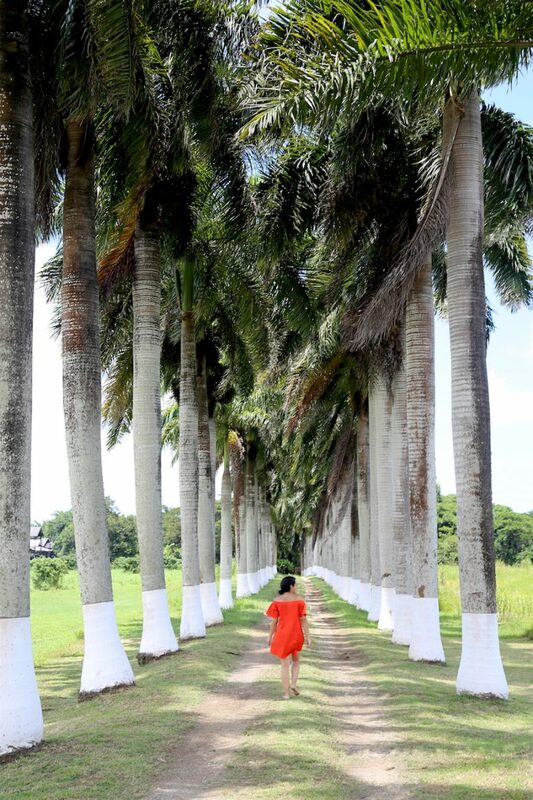 The Hampden Estate Rum Tour will sweep you off your feet right from the palm tree lined entrance to the working distillery that was established in the 1750’s. Not to mention their Rum Fire punch that will welcome you to the tour. 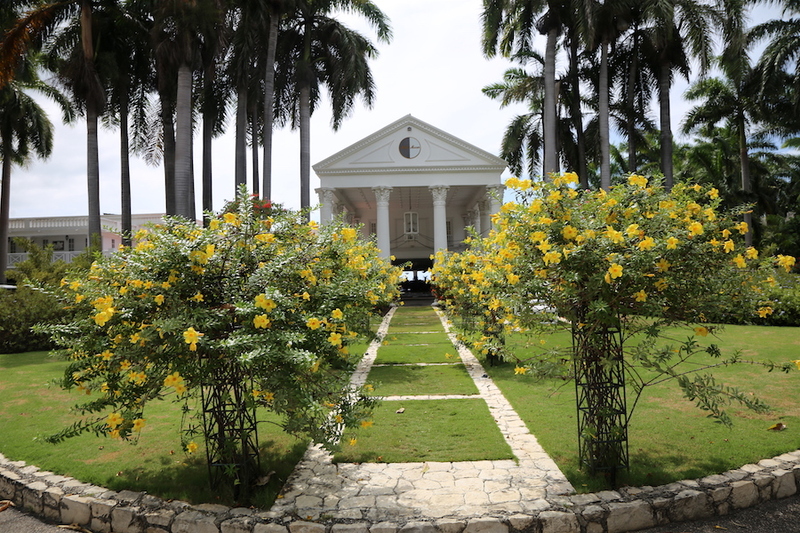 Take the time to explore these picturesque grounds, learn the distillery process and sample some of the best rum around. True to their word, Half Moon Luxury Resort is a destination in itself. What would you expect when you pair 400 acres of manicured grounds with two miles of pristine beach acting as the backdrop? With 197 individually appointed rooms & suites; 31 villas (most of them offer views of the Caribbean Sea); an award winning spa; an 18-hole golf course and an equestrian center featuring 28 horses, Half Moon Luxury Resort certainly over-delivers (if there is such a thing when comfort and luxury are concerned). If you thought that was too much, wait until you dine at the ‘Sugar Mill’ (see below!) – awarded and lauded as the best restaurant in all of Jamaica. What? 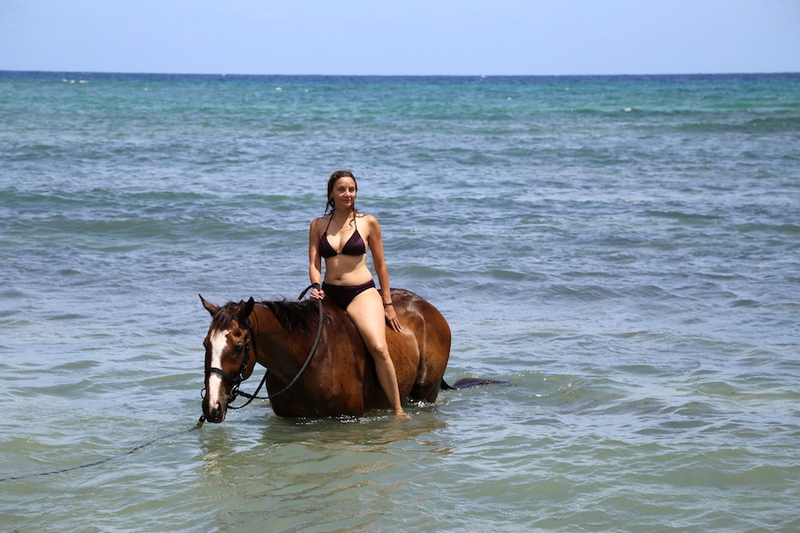 Swim with horses? You did not read that title wrong! 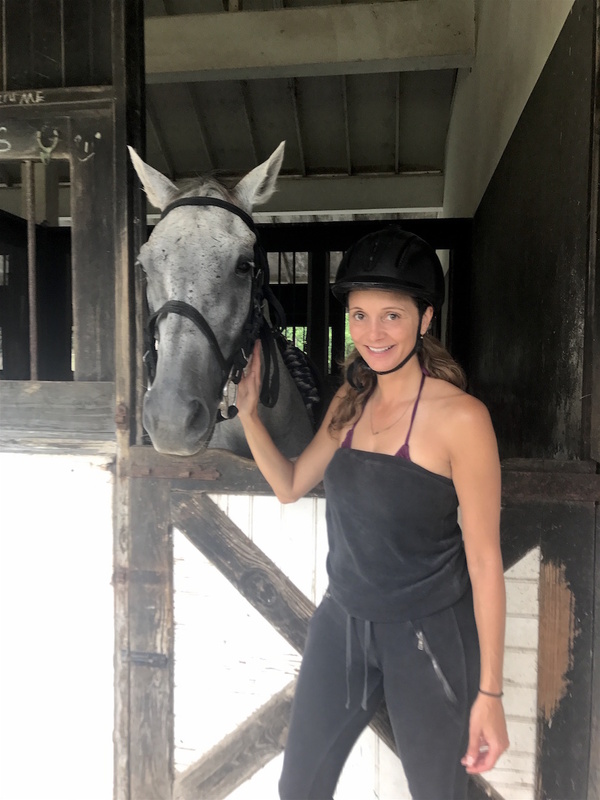 At Half Moon Resort they have an impressive equestrian center and their Turf-n-Surf program is the highlight: a horseback ride along the oceanfront, plus a swim with the animals. 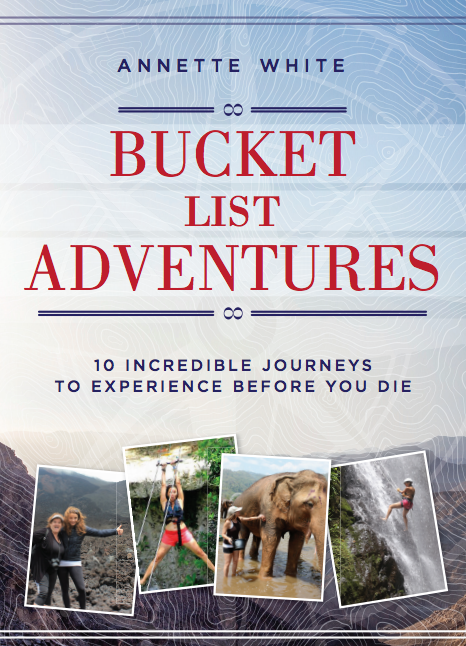 A definite bucket list once-in-a-lifetime! Dining at the Sugar Mill restaurant is a luxury experience to savor with its exquisite outdoor seating amongst the foliage and unique twist on Jamaican cuisine. They specialize in putting a spin on Caribbean flavors (like with the crispy jerk chicken rolls with cho cho Slaw and sorrel-dark rum chutney). A stay at the Half Moon Resort wouldn’t be the same without a dining experience here. 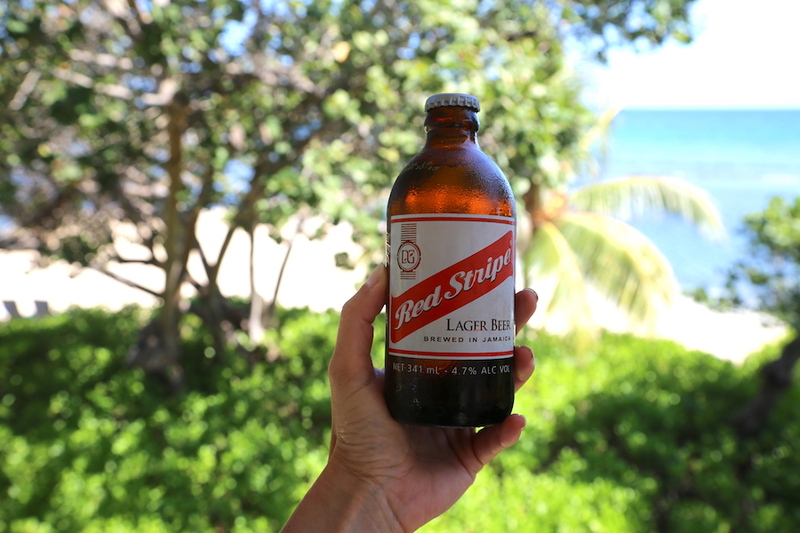 No trip to Jamaica would be complete without having their local brew, Red Stripe. Brewed by Desnoes & Geddes, this 4.7% pale lager is almost as popular as rum in Jamaica. It won’t be hard to get your hands on a bottle (or two) and just stare into the sunset as the cool Caribbean breeze carries your troubles away. 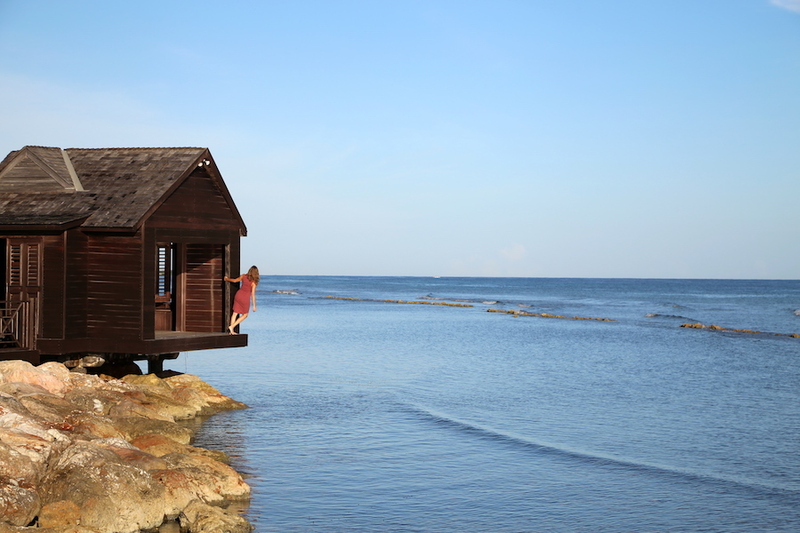 There is a lot more to do in Jamaica’s Montego Bay and the surrounding area. You haven’t even partied at Jimmy Buffet’s Margaritaville; taken a tour of the old Rose Hall (one of Jamaica’s oldest plantation homes belonging to the ‘White Witch of Rose Hall; thought to possess serious black magic skills); spent a few sunny hours on Doctor’s Cave Beach and tour the phosphorescent lagoon at Glistening Waters (you have to see this bioluminescent lagoon at night!). Honestly, 48 hours are not nearly enough. Want more Jamaica? 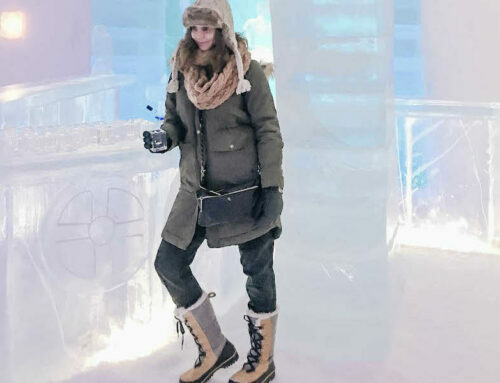 Here’s an incredible video of our trip by Jennifer at The Travel Women (you can also check out her luxury guide to Jamaica!). 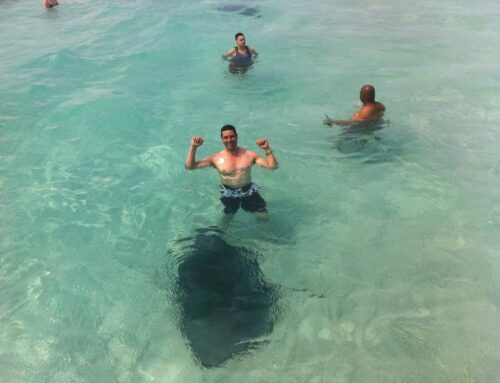 My luxury trip to Jamaica was hosted by the Jamaican Tourism Board. All opinions my own. Jamaica looks gorgeous – after travelling around the Bahamas I´ve really been inspired to get to know more Caribbean islands! Walking along the pink sands beach, soaking up the sun or sampling Bahamian cuisine was really a fantastic way to spend a relaxing few weeks. 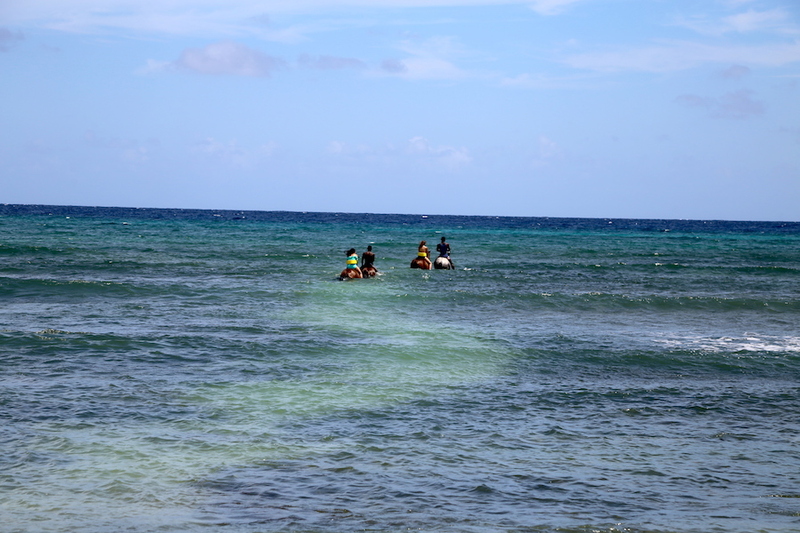 Swimming with horse and bamboo river raft ride seems like a different experience. 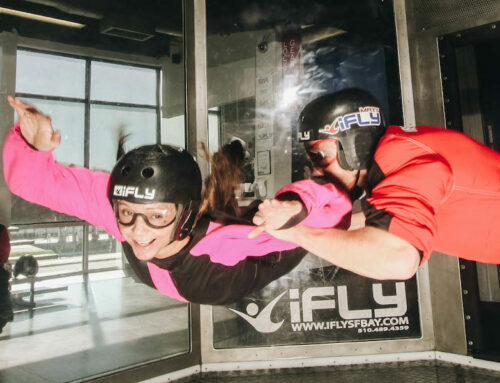 Must give a try once in life time. Montego Bay is my favorite in Jamaica. 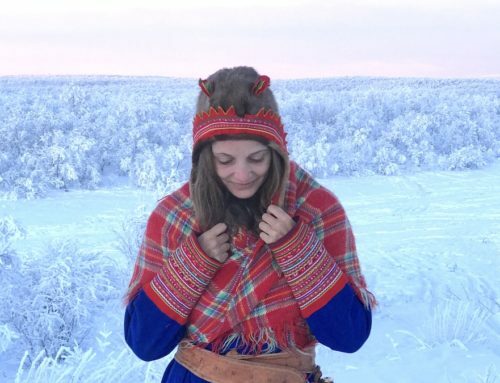 There are many other places to enjoy. but i like Montego Bay Excursions the most.